Sulfone Polymers Market Size was valued over USD 1.5 Billion in 2016, and the global market revenue will grow at a CAGR of 6% up to 2024. Sulfone Polymers are strong and rigid plastic materials which remain transparent during high temperatures, over 204°C. They offer high heat resistance, thermal stability and oxidation resistance to various electrical & electronics products such as printed circuit boards, aircraft radomes, connectors and terminal blocks. Their characteristics such as hydrolytic stability, transparency, and heat absorbing benefits have made them ideal choice for medical and food application. Moreover, it is known for its toughness, low mold shrinkage and creep resistant properties which is suitable for industrial applications where high dimensional stability is highly recommended. The demand for sulfone polymers from automotive and aerospace industries is highly increasing. These polymers provide great toughness and stability at high temperatures, and meet the complete requirements of a “working plastic”. High thermal stability, high strength, oxidation resistance, and excellent flame retardancy are making these materials to be consumed more in automotive applications. Many commercial grades of sulfone polymers can tolerate high temperatures for a longer time and some materials, such as polyphenylsulfone, are enormously tough and have huge impact strength as compared to the conventional polycarbonates. These factors will positively influence the market over the forecast timeframe. Growing trend of replacing the metal with less-weight engineering materials in aerospace industry will significantly drive this market. The increasing demand for low-weight aircraft products is making major manufacturers to produce more products for almost all aerospace polymer applications which will further augment the market growth over the forecast period. Stringent government regulations regarding the use of BPA in some industry verticals will hinder the market over the forcast timeframe. In some medical and food applications, government approval is required as regulatory bodies limit the use of sufone polymers, to maintain food quality standards which will restrict the growth of global sulfone polymers market. Heavy maintenance cost is challenging the investors and manufactures in the sulfone polymers market. Additionally, high R&D costs for developing innovative technologies will negatively affect the market in further. Among all the product types, polysulfone is dominating all product, while polyethersulfone will witness the fastest growth with a CAGR more than 6% over the forecast period . Polyethersulfone segment is estimated to be the fastest growing over the entire forecast timeframe. The superior properties of polyethersulfone such as low smoke emission, light weight, good impact resistance, dimensional stability and chemical resistance are useful for various applications such as electrical & electronics, aerospace, automotive and medical which will further enhance market growth. The polysulfone products are highly used in medical applications, and it also offers ease in manufacturing membrane which have wide application in water treatment, food processing and gas separation operations. Thus, it can be consumed in various end-user industries owing to its durable properties, and the demand for this product is likely to grow over projected timeframe. The automotive segment holds the lion’s share in terms of market volume with a CAGR of over 6% over the forecast period. Due to growing automotive application and government initiative regarding the development of transportation facilities, the consumption of sulfone polymers in transportation industry is rising. Medical application is leading the global sulfone polymers market in terms of volume by 2016 with highest market share and is likely to grow over forecast period. Growing demand for better medical application from emerging economies of Asia Pacific is propelling market growth. Further this segment is driven by rising innovative application of sulfone polymers in manufacturing various medical devices by design and technology developments enabling their use in medical devices, replacing traditional materials which will substantially trigger the demand for sulfone polymers globally. In terms of region, Asia Pacific will be the fastest growing market over the entire forecast period. Growing industrialization and rapid urbanization in emerging economies of Asia Pacific will assist the growth of Asia Pacific sulfone polymers market over the projected years. Asia pacific sulfone polymers market is increasing due to growing usage in countries such as China, Japan, India etc. China holds major share owing to high automotive production and growing manufacturing of medical devices. Furthermore, India is expected to grow fast owing to increase in automotive production, aerospace growth, electrical & electronics growth etc. North America is found to be the second fastest growing region with CAGR of around 6.2% over the coming years. 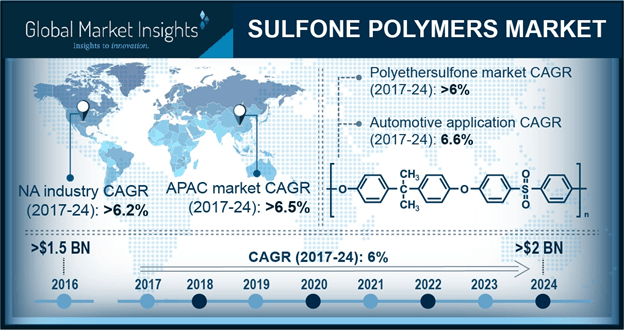 North America sulfone polymers market is growing owing to increasing medical devices manufacturing and automotive production in the region. United States is the fastest growing country in this region owing to high automotive and aircraft production in the region. Furthermore, due to shift in usage of high performance plastics in various industries will augment growth of sulfone polymers market in the region. 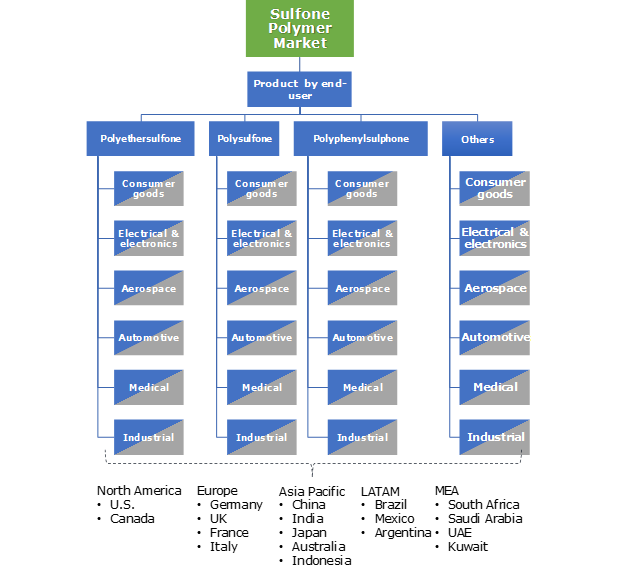 Leading players operating in the global sulfone polymers market include Specialty Polymers USA, LLC, Sumitomo Corporation, PolyOne Corporation, BASF SE, Sino Polymer, Jiangmen Youju New Materials Co., Ltd., SABIC, Evonik Industries AG, GEHR GmbH., Ovation Polymers.Inc. and Infinity LTL Engineered Compounds. Key industry players are investing heavily in the R&D and its production facilities to expand its geographical presence and attain competitive advantage in the business. For instance, Solvay SA is enhancing their manufacturing facility in India, to increase their sulfone production capacity to meet the rising product demand in the near future. Furthermore, major players are also investing to enhance their production capacity to combat fluctuating raw material prices. Sulfone Polymers are kind of thermoplastic materials derived from a combination of both bisphenol A and disphenol. These are used to produce various types of sulfone polymers like polysulfone, and polyphenylsulfone. Among these polyphenylsulphone is one of the high-quality engineering plastic which is often used for producing medical devices as well as used for treating waste water. Whereas polyethersulfone segment was the highest priced segment in 2016, high price is mainly accounted for the quality, and durability of the material. Rising usage of sulfone membrane in water treatment application in Asia Pacific is increasing. This is attributed to growing population in the region, which has given rise to industrial and sewage wastewater and therefore rising hazardous implications to human life and environment. Moreover, rising demand for better medical services across the globe will drive sulfone polymer activities and will boost product demand in the coming years.